It’s a good feeling waking up on the Tuesday morning at The All England Tournament knowing that we are up-to-date. But, at the same time I feel there’s something wrong, something we haven’t been told. Historically Tuesday is qualifiers day but this year the format is different. It’s a shame as the previous week at the German Open there was one on the Tuesday. This allows more hopeful players, especially homegrown talent to have a chance of playing at the All Englands and getting great experience of playing such a tournament. For the players attending this year, Tuesday is a practice day and perhaps they will have the opportunity of playing for longer in the arena because of the qualifier omittance, therefore getting a better feel for the conditions. With the tournament being played with a similar format to the World Championships, there will not be easy matches and no doubt a few first round upsets are possible. 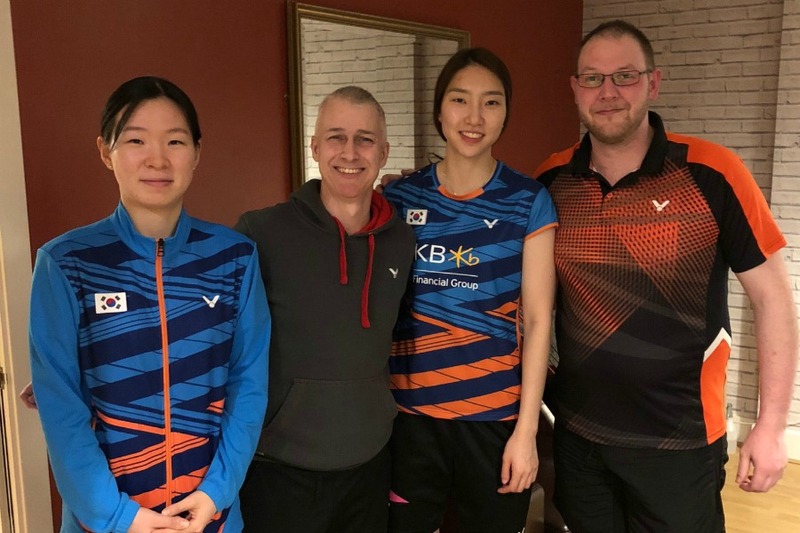 Whilst I hope all Victor sponsored players will win and progress to the latter stages of the tournament, I question the mental condition of the Korean players having just heard the news of the death of legend Jung Jae Sung. He was a great player and one of my favourite men’s doubles players. It’s a sad loss to the game and I’m sure his passing will be a big blow to the Korean squad. Our first customer on Tuesday is the lovely Ashwini Ponnappa from India. I last saw Ashwini at the World Championships in Glasgow so it was good to hear her news. Soon after, players started arriving. 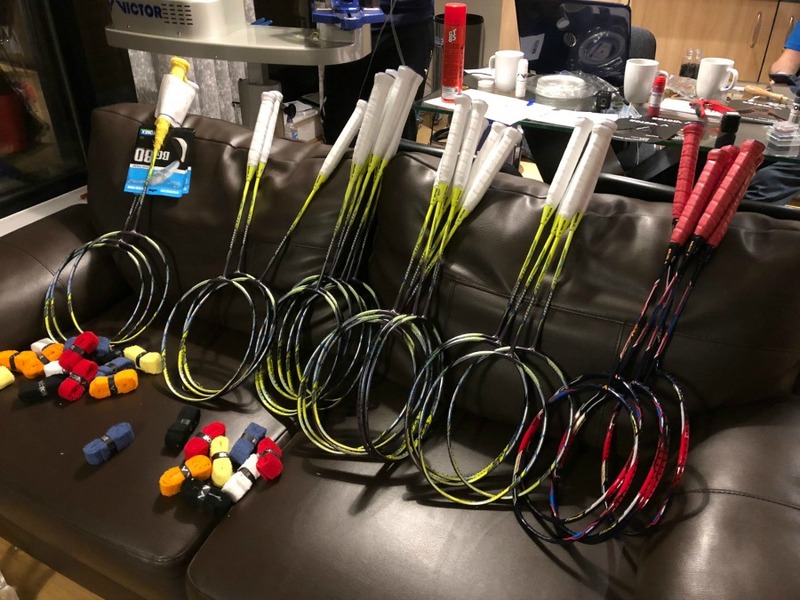 More Korean players, Tan Wee Keong from Malaysia, and Lee Yang returned with rackets to restring in addition to collecting those we restrung on Monday. Whilst we were getting busy, there was still no sign of the usual huge wave. Ben Williams from Victor arrives around lunchtime, just in time for him to make the tea whilst we are stringing. He is setting up the Victor showroom in another hotel, however, the shipment hasn’t arrived. A slight aside. The weather forecast for this week in Birmingham wasn’t good. Whilst it was only day two, it was cold, wet and snow was expected, along with high winds. Oh joy! I’m sure the players will cope but it won’t make the arena and the local restaurants as appealing. I walk to the showroom hotel with Ben whilst we are not too busy. Whilst there I receive the shock news that six of the Korean player’s luggage did not arrive from Germany which included their rackets! Ah, that explains why we have received so few rackets compared to previous years. 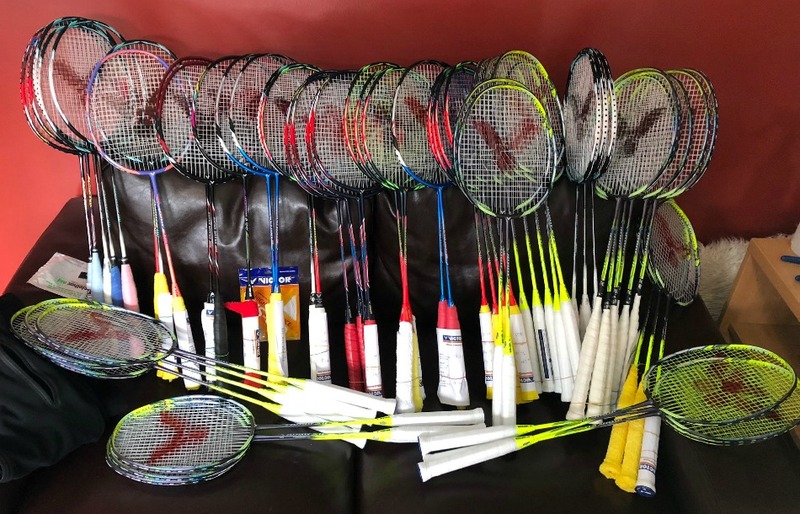 I am advised that the Victor representative from Europe will be arriving as expected around 10pm but he will have around 30 rackets for us to restring for these players. On hearing this news, I know the implications for us. Have you figured it out…? Play begins on Wednesday morning at 9am. With the news that 30 rackets are arriving very late from Germany, it is clear we will be stringing into the early hours of the morning. The order of play has not been advised yet which means we must have all of the rackets ready by 8am to ensure the players can collect and warm up in the arena in time. They will also need time to add their grips, so this is still cutting it fine. On hearing the news, I return to the stringing room to find more rackets have arrived. 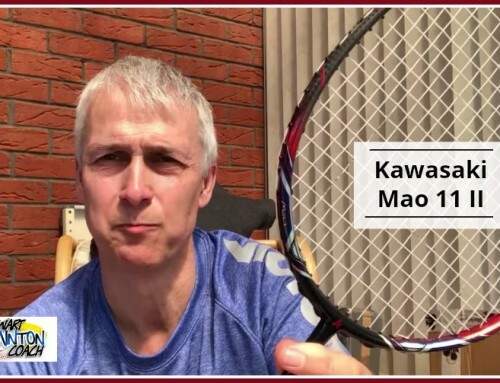 I discuss with Matt the timings and that we need to restring as many rackets as possible before the new rackets arrive. At least we won’t have to worry about changing grommets on these rackets. This is going to leave us little time to eat so we order another Chinese takeaway. Whilst restringing, early evening, we receive more rackets so there is now a queue. Whilst eating our food, more players arrive including Marvin from Germany who requires six rackets restringing and his mixed partner two. We are now under pressure. I receive a message that the flight is delayed from Germany so we won’t receive the rackets until 11-11.30pm. With the increasing backlog I take the decision that we must continue stringing throughout the night, otherwise we would not have the rackets completed in time. Later that night around 10pm I receive a message from Marvin that the order of play has been released and he is on court first. He arranges to collect his rackets at 8am. In addition to the pile of rackets I must restring, Marvin’s rackets must be ready on time. Whilst waiting for the new rackets to arrive from Germany, I contact Victor to arrange for the players who need rackets to visit us with their string and tension requirements. After all, they will be in bed when the rackets arrive and I will be unable to disturb them. By the time the new rackets arrive, we are fully organised and already in full flow. As a quick aside, one of the biggest challenges we face when stringing in any location is the quality of light. This becomes even more important when we restring through the night. With eyes tiring, poor light makes the job even harder, whereas quality lighting provides that additional clarity required. At this years All England’s my lighting specialist friend Mike Gorman introduced us to a new light, which was a revelation. It is the size of a Go Pro camera and is powered from an internal battery plus can be externally charged from a small phone charger. Mike mounted one on a tripod and fitted another to the existing light shade above my stringing machine. All I can is WOW! What a truly amazing piece of kit. The quality of light that emitted from this small unit was simply amazing and without question, helped us achieve our goal of stringing throughout the night, maintaining speed and a quality job. I don’t think we could have achieved as much without this additional lighting. My thanks to Mike and Litra for saving the day! The new rackets are organised by player and then split between myself and Matt. With the enhanced lighting, we plough through the massive backlog. There’s lot’s of talking throughout the night. It was the same with Mark in previous years but the difference is that the TV was never turned on. At 4am we decide to have a short break and record a couple of videos to prove we are still awake and working! Interestingly, we were still pumping out rackets in 22 minutes which is exceptional considering the circumstances. The out couch is looking rather full which is great to see. We welcome in the dawn of a new day, knowing that we have limited time before players will be arriving to collect their rackets. Marvin’s rackets are ready for collection and we reckon he will arrive first. After that, we are enjoying the fact that the number of rackets on the “in” couch are rapidly diminishing. Despite being tired, our pace has quickened. We managed to find the order of play and therefore do not expect some players for a few hours. But we want them done and ready. Marvin arrives to collect his rackets and cannot believe we have been stringing rackets throughout the night. He is soon followed by other players and the collection pile is looking good. By 11am we have completed all restrings. This is an All England first as historically, Wednesday has been a catch up day with players competing in the arena. As you can appreciate, Matt and I are tired. 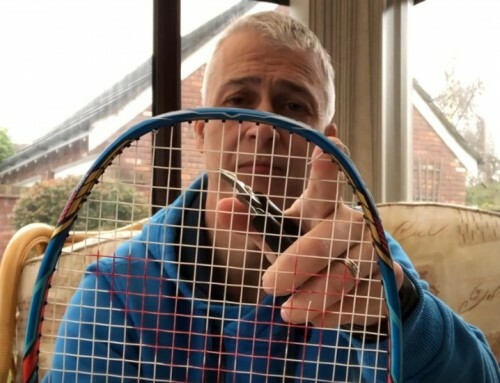 But, we know we’ve done a great job and without our stringing service, the players would not have had rackets to compete with, although I’m sure there would have been a passing around of rackets between them. 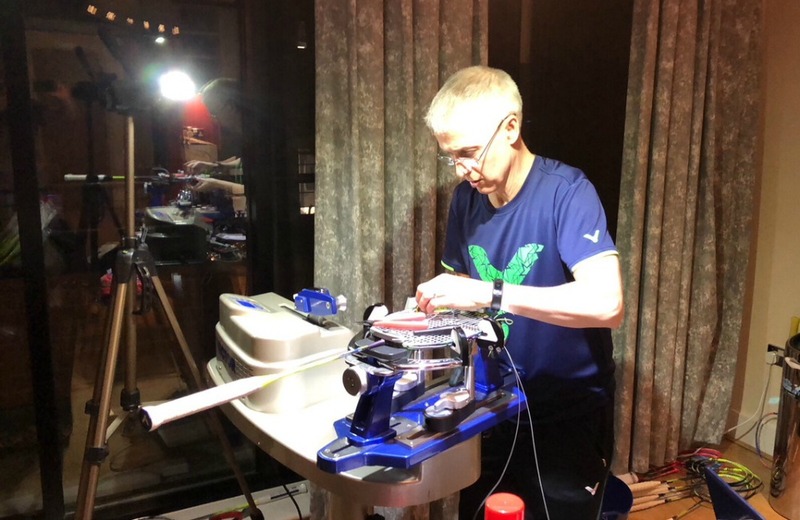 Yonex stringers start later in the morning around 8 or 9am and they close at 7pm. 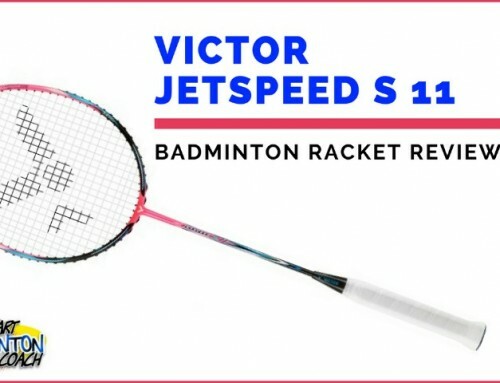 I cannot imagine that they would have prioritised Victor players rackets over Yonex sponsored players rackets if Victor did not provide a stringing service for their players. One of our rules in the stringing team is that the stringing room must be manned throughout our long opening hours (8am – 10pm). With all rackets completed, I decide to visit the stadium whilt Matt will have a quick snooze on the empty “rackets in” couch. It doesn’t take long before I am deep in meetings either in the coffee area or inside the arena watching the action. Being so tired, I cannot watch the badminton for too long, my eyes are closing and I’m nodding off! So, it’s easier to meet and greet as many people as I can which keeps my energy high enough. I don’t stay too long in the arena and return to the stringing room to allow Matt a chance to see the badminton too. Like me, he would prefer a sleep but steps out into the cold to get some fresh air before entering the arena. Maybe he’ll wake up a little. Kim Ha Na arrives with a racket, and throughout the day other players arrive to bring a small number of rackets for restringing. They are all completed on the day. By Wednesday night, all rackets have been restrung. It’s a first, we are up-to-date! 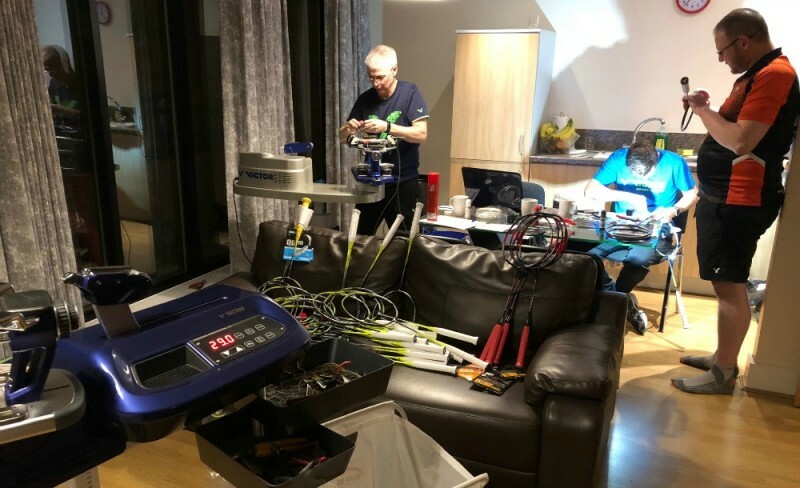 Amazingly, our All England adventure is almost over, as we already know that we won’t receive too many rackets for restringing due to the players returning home after the tournament rather than moving on to the Swiss open. We closed on time and then had an early night. It was a good 48 hours and now it’s time to sleep. It’s Thursday morning and the snow has arrived. It should be an easy day, mainly sitting around and waiting for players to collect or deliver rackets. 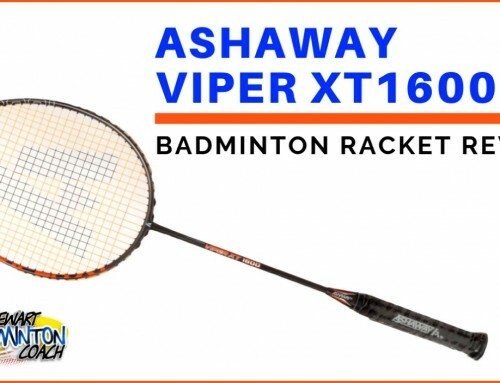 I’m not expecting many rackets as players will be in the arena or out of the tournament. 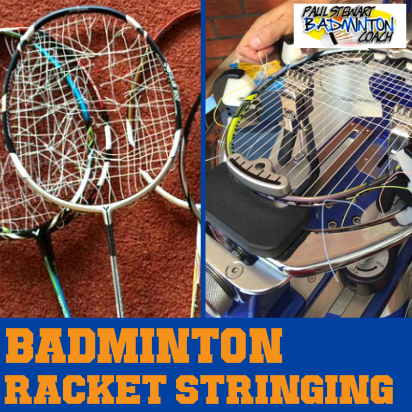 It’s unlikely players who lost on Tuesday will have their rackets restrung. 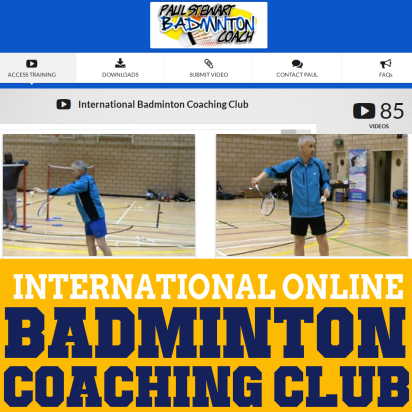 Thursday onwards becomes a mixture of meetings, watching the badminton and stringing a few rackets. I had the pleasure of watching many great games. 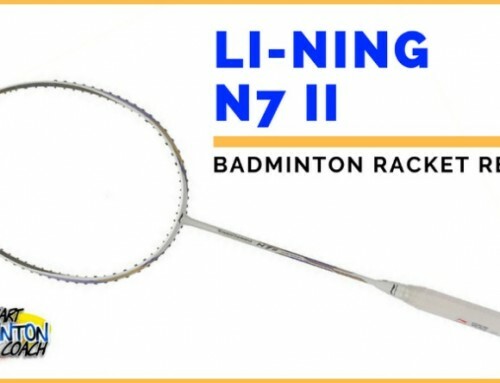 Sadly, the eagerly awaited Lin Dan versus Lee Chong Wei match was a disappointment. Lee didn’t bring it and Lin Dan had the psychological upper hand once again. On semi-finals day I had meeting after meeting and therefore did not have the time to enter the arena. It was a shame but that’s how it goes. 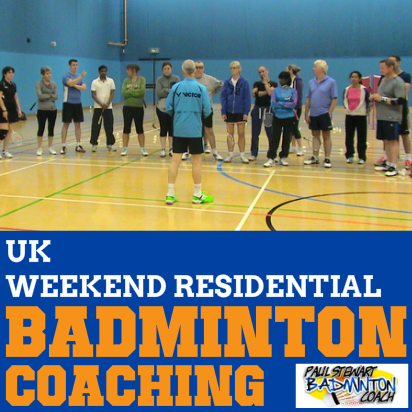 With all but one racket returned, Saturday night was quiet and gave us time to reflect on the week. It was a strange All Englands. The new format and change in the international diary, resulted in a quiet end to the week. It was a shame because it’s so much better when the pace is high and at times, a bit frantic. Maybe next year it will be different. If the Swiss Open returns to its usual date following the All Englands, we could be a lot busier. 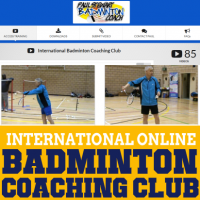 2019 sees the build up to Olympic Games qualification so I expect to see more players emerging from junior ranks needing to gain international experience. My thanks to the entire Victor team in Birmingham for another memorable tournament. Hopefully, I will return to Birmingham in 2019 as Head Stringer for Team Victor again.